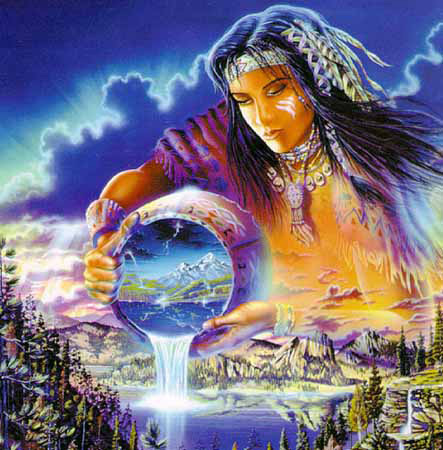 A vision quest is a rite of passage, similar to an initiation, in many Native American cultures. Since the beginning of the cycle of time, humanity has returned to nature to connect with spirit and to seek answers to problems of the physical realms, especially in this timeline when the messages of prophecy reveal themselves to the seeker. The quest itself is a journey alone into the wilderness seeking personal growth and spiritual guidance from the spirit and Creator. Traditionally, the seeker finds a place that they feel is special, and sits in a 10 foot circle and brings nothing in from society with the exception of water. A normal Vision Quest usually lasts two to four days within this circle, in which time the seeker is forced to look into his or her soul. Many times a strong urge to leave the Quest area will come to the seeker and a feeling of insanity may set in. However, the seeker normally overcomes this by reminding him or herself of the overall outcome of the Quest, causing the mind to stop wandering on random thoughts. The individual can generally find solace in the fact that he or she will not die in just two to four days. Generally a physical representation of the vision or message such as a feather, fur or a rock is collected and placed in the seeker's medicine bag to ensure the power of the vision will stay with the individual to remind, protect or guide him. The Vision Quest of DTESS is for the Two Spirited People and based in Native American teachings with some variants to it. For example in most of Native America the vision quest involves some kind of sacrifice and going without food and water for four days. I believe that this is too traumatic to the body and that the vision you receive from such, is a vision based on depravation. Therefore this type of vision premise is induced by lack of water and complete loss of senses followed by a mild form of dementia due to dehydration. Can we then call it true vision? Certain First Peoples strongly felt that if you are not living your vision you are living your death. In our practice of the Vision Quest, the Elder gathers the people seeking such and question their purpose. The Elder then makes a decision with them if the Vision Quest is going to be 1, 2, 3 or 4 days. Accordingly they are aloud to bring 1 litre of water per day and 2 pieces of bannock bread. This is so that the body does not go too much in shock especially for those who are diabetic or on different types of medications. People are then asked to bring all of their medicines but no reading material. They are to set up camp in a circle of tobacco with a doorway so that they can leave their circle when they need to do their daily business and return immediately to their circle. They are to smudge the circle at least 4 times a day and observe what is happening within themselves and their physical surrounding as the tiniest insect can bring teachings. It is a time to commune with the Universe and Spirit will tell them when they are finished. The first purpose of a Vision Quest is to leave behind your everyday life and all the things you hold dearly around you to make yourself feel safe in your world today. Second, it's a sort of shaman's death. You stay with your Quest long enough and seriously enough to allow your physical and spiritual centers to become open to the Universe and feel completely in communion with Great Spirit. For a few moments, time becomes irrelevant, and you are completely a part of the Universe and not just yourself. Thirdly, a re-birth of yourself into the common life of the world you live in happens. Then it is inherent upon you to carry this illumination and knowledge, which you receive of those timeless moments, and share some of it with others and the rest you always carry for yourself.